TSP02, the superior polyester-based film for modern cooking, LOOK oven bags are the perfect choice for meat (stays wonderfully moist with all its flavour) and vegetables (keeps them fresh, crisp and tasty). The bags are also suitable for microwave cooking and can be used to freeze, defrost and reheat plated meals. 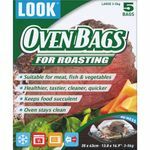 LOOK oven bags couldn’t be easier to use. Simply insert the meat, fish or vegetables into the bag, add seasoning, tie the bag, snip off a corner and place the dish in the oven or microwave. Cooking time is up to 10% shorter when using oven bags, and there is no messy oven to clean afterwards. All you have to do is sit back and enjoy your perfectly cooked, beautifully succulent meal. Oven bags made from an advanced material that gives optimum results for today’s cooking applications. You don’t lose any flavour when you cook with LOOK oven bags. They allow the juices to circulate and infuse back into the food being cooked, giving you mouth-watering results every time. Manufactured from TSP02, the superior polyester-based film for modern cooking, LOOK oven bags are the perfect choice for meat (stays wonderfully moist with all its flavour) and vegetables (keeps them fresh, crisp and tasty). 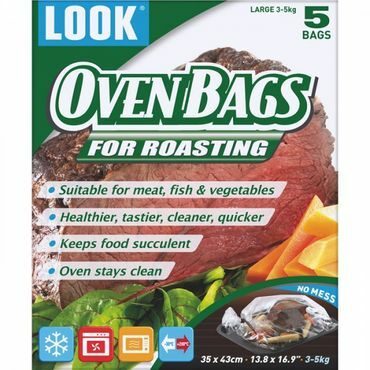 LOOK Large Retail Oven Bags (35cm x 43cm) x 5 has not been evaluated yet.